COROLLA – Beset by a similar stop-and-go pace, high costs and heated public debate as the nearly-completed Bonner Bridge has been, the proposed mid-Currituck bridge project is close to having an important step finalized that could potentially open a path to its construction. An evaluation of the 2012 final environmental impact statement is nearly complete, said Rodger Rochelle, chief engineer for the North Carolina Turnpike Authority, which oversees toll road projects in the state. 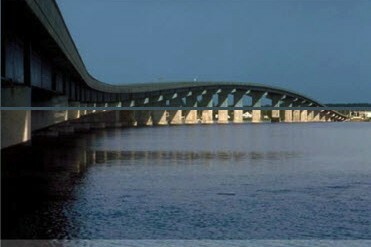 The proposed 7-mile, two-lane bridge would cross the Currituck Sound, connecting U.S. 158 on the Currituck County mainland and N.C. 12 on the Currituck Outer Banks. The review, conducted mostly by North Carolina Department of Transportation and Federal Highway Administration staff, has been considering if there are changes since the environmental impact statement that would necessitate additional study. If it passes muster, as Rochelle expects, a record of decision that details financing and scope of the bridge could be issued sometime this summer. “We are still very much hopeful,” he said. The decision, which had most recently been expected in April, would be essentially the go-ahead for the project, although numerous hurdles – including funding and potential lawsuits – could derail the mid-Currituck proposal. First proposed about 25 years ago, the project has been revived from bureaucratic near-death several times. Currently, the preferred alternative would anchor the bridge off U.S. 158 north of Aydlett on the Currituck County mainland and landing between the Corolla Bay and the Monteray Shores subdivision on the Currituck Outer Banks. Project costs have varied from about $660 million to $489 million, and proposed funding mechanisms have included public-private partnerships, state appropriations and gap funding, and tolling. The current “ballpark” cost of the project is about $440 million, Rochelle said. Of that, the estimated cost to NCDOT would be $173 million, Carly Olexik, NCDOT public relations officer, said in an email. Rochelle said that the agency is reviewing work done in the past by the private developer involved in the public-private partnership. “We’re revisiting those assumptions,” he said. Traffic and revenue studies that inform the environmental study are also being updated, Rochelle said. Proponents of the project, including Currituck and Dare counties and the towns of Kitty Hawk, Southern Shores and Duck, say the bridge would relieve hours-long traffic backups in the summer to and from Corolla and is critical to safe hurricane evacuation. The bridge would shave off about an hour on the drive from Virginia. But opponents say the bridge would damage the environment and make the situation worse by bringing in more people than the community can handle. The opposition group, No Mid-Currituck Bridge also claims that the toll would have to be as much as $50 to cover the cost of the bridge. Olexik with NCDOT said the average summer weekend traffic in 2016 on two-lane N.C. 12 in Southern Shores was 22,827 vehicles. In 2017, it was 22,236 vehicles.